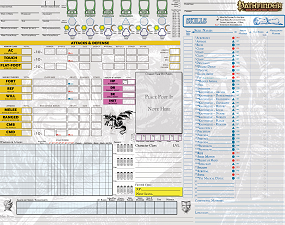 Here are the customer character sheets I've made for use with my latest game I'm DM'ing. 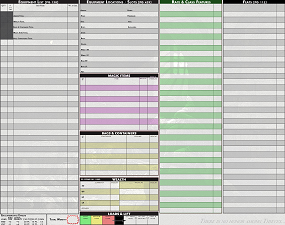 I've included the Main Sheet here which has most of the items you'll be looking at during a game, AC, HP's, Skills, Weapons and Ammo, etc. 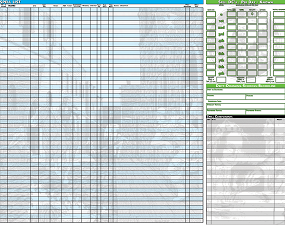 The rest of the pages, Sheet 2 - Gear/Feats/Class Abilities, Sheet 3 - Spell Sheet, Sheet 4 DM Helper/Player Aid (NPCs/Hirelings and Animal Companions). This is the point I took over DM'img. So essentially I'm running a Dungeons and Dragons 2nd Ed Planescape Campaign using the Pathfinder RPG and converted DnD 3.5 Characters, with a few odds n ends from DnD 4th edition! I use modified "one hit minions" from 4th ed DnD on occasion! Chris Perkins was correct they're fun for both the Players and DM! Players like em, at first, because they allow them to kill droves of them with mighty spells and combo feats making for great visuals and heroic actions! The DM likes them because they surround and hit for devastating results as well as press the players after killing waves and waves of them with no end in sight! He he he. If you have any questions about my Planescape Campaign please shoot me a email or comment below! 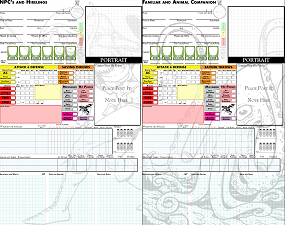 Alrighty, here are the rest of the Character Sheets!